A decentralized type reddit. It uses tagged data for the main topic and messages with reference transaction ids for the comments. I still need to test it when data starts getting pruned. It would be pretty cool to have something like that in the client. Thanks! If you (or anyone) gets a chance to try it on the TestNet, I would appreciate some feedback. I won't be working on it for the rest of the day, but tomorrow I hope to resolve the last annoying bug and look more at the missing features (and any feedback). Sorry, out of the house today and can't connect to the network in the library. I would love to test,but this file link http://expirebox.com/download/51367108d7324aa068a00bb554222fba.html is Expired or Deleted. Sorry about that. I was hoping to have everything in GitHub before the links expired. 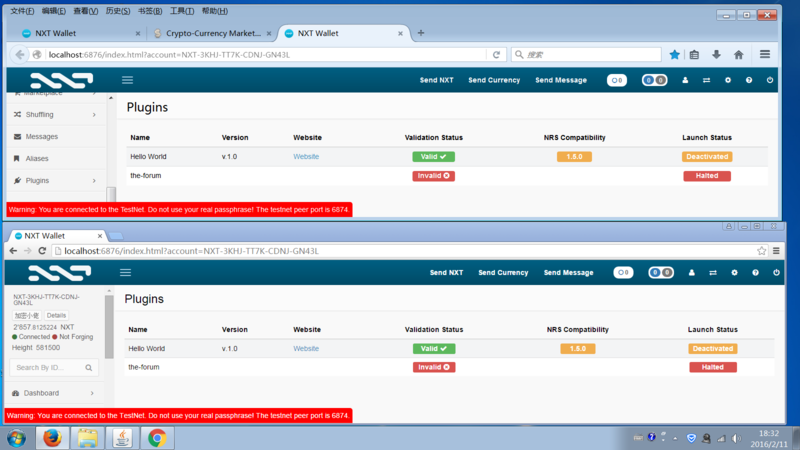 After install NXT-the-forum PLUGIN,the Validation Status show "Invalid",hint message is "Missing plugin files".But I copty the whole NXT-the-forum-0.8.2 folder. I think I know the issue. Trying putting all the plugin files in a directory called "the_forum"
If that fixes it, I'll resetup the GitHub to follow that folder structure. Also, could you try another browser? I've had issues with the browser cache and the plugins. Thanks! I tried firefox and chrome,both not working,what's browser you use? I'll look and see if I can find where that - is coming from. You are right,the problem is the name,sorry. I'm testing now,will reply some feedback later.Good work! I have some suggests,I know this plugin is in early stage,you may already plan to add those functions. 1) I add a png image,but didn't see it in my topic,and can't find a link to downloading. 2) No reply button for sub sub comment. 3) Maybe add a return button for each topic. Thanks for taking a look and the feedback. 1.) Currently the image is not used anywhere, but the code in the NRS UI requires a file on uploadTaggedData. I have to look more at the API as I want to upload both a file and text, but the file should be optional. 2.) This one I have just been too lazy to revisit I just need to find an efficient way to do the loop here. Right now, I am manually checking the first and second levels without a loop. 3.) Do you mean a return to the main menu? You can click on the plugin's name in the left menu to go back, but I suppose a return button would be more user friendly. Thank you again for the feedback! I plan on working on these more this week again.